Hypoallergenic. No need for invasive surgery. Works for people and pets. This is the eye drops that was featured in the Judy and Richard TV show and in the Daily Mail newspaper. This was the product that was tested on a clinical trial featured in the show. It helps to safely clear cataracts and help in other eye disorders as well. We are an authorized seller of the genuine product as you can check in the seal below. How Long Will Healing Take Place? The healing process varies across individuals. Some had good vision returned within seven weeks of using our eye drops, others in seven months to one year. Cataracts among Asian are also more resistant that those in the West. On average, the treatment period is 6 months. If the drops are used as frequently as possible, at least twice a day in each eye, they will eventually begin to dissolve the cataracts naturally off the lenses. Healing also depends on the age of the cataracts, the health condition of the person, and frequency of using the drops. The less mature the cataracts, the easier are they to treat. Healing cataracts usually take longer for those who are diabetic or who use steroids because these are cataract-causing agents. You will know if the drops is working for you in a matter of weeks of using it. Ethos NAC eye drops has helped thousands of people on the world who suffer from cataracts but due to health reasons cannot undergo surgery. Click here to read testimonials from satisfied customers. Why Use Bright Eyes Cataract Drops? Ethos NAC eye drops is safe, can be administered at home by anyone. It has no side effects. It is an eye health supplement as well. Ethos eye drops are free of animal ingredients and may be freely used by vegetarians. Ethos eye drops are safe and suitable for use on pets and other animals. Ethos eye drops is safe for use by diabetics and is compatible with all antidiabetic drugs. Ethos eye drops may be safely used by contact lens wearers (both hard and soft). Ethos eye drops is safe for use by people with glaucoma. Ethos eye drops are safe for use by people with cataract. It is safe to use also on your pets. Bright Eyes contains 1% N-Acetyl-L-Carnosine, a naturally occurring antioxidant and anti-glycating agent that, when topically applied, can penetrate and protect the lipid tissues of the eye against light damage. Bright Eyes will help to diminish free radical damage and the harmful effects of glycosylation associated with degenerative eye disease. Ethos NAC eye drops Bright Eyes is not only for those with eye disorders. These eye drops contain lubricants and N-Acetyl-Carnosine which is a Powerful Super Antioxidant. This unique combination helps to Soothe and Rejuvenate tired eyes… naturally. Ethos NAC Eye Drops are safe to use with contact lenses. It can be used in conjunction with other drops. Having had surgery due to previous eye problems will not interfere with the drops. Direction for Use: Apply 2 drops in each eye in the morning and in the evening daily. Those with any kind of eye problem may want to apply 1 to 2 drops several times a day. Each 5ml bottle should last 30 days at two drops per day or 15 days at four drops per day. A box contains 2 x 5ml bottles; therefore each package can last between 30 and 60 days which represents excellent value for money. It is also recommended that you take 1 gram of Ethos Endymion Supplement in powder form daily. Unopened bottles should be stored in the dark in the refrigerator. Once opened, the contents of the bottle should be used within 30 days. You may place the bottles inside a larger canister to avoid freezing and contamination. To maintain the potency of the drops, wrap the canister with dark material so that light will not penerate through the bottles inside. Make sure hands are clean before handling the bottles to avoid contamination. If you have other drops prescribed by your doctor, allow at least 1 hour interval before or after Ethos NAC eye drops to allow each one to work. 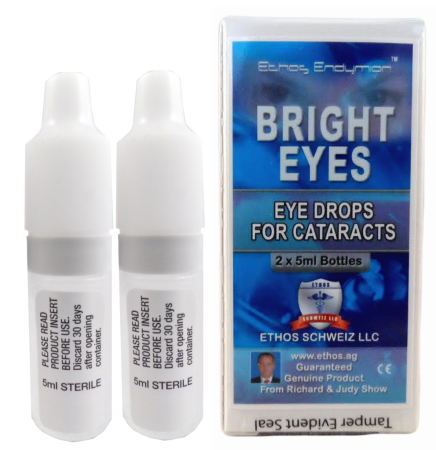 Be the first to review “Bright Eyes Cataract Drops” Click here to cancel reply.